A must see! 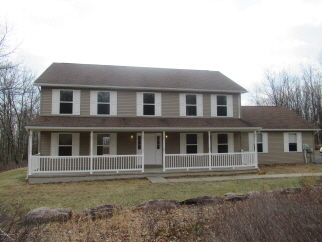 Completely renovated 4 bedroom, 2.5 bath colonial situated on 5 acres in an upscale Pocono community. Attention was paid to every detail of this home, freshly painted & natural light throughout. Features include: 3/4'' hardwood floors. Stone faced fireplace in family rm, new kitchen w/center island, granite, ss appl. & dining area, large formal dr & lr, laundry/mud rm w/ss washer & dryer. 4 spacious br's w/ample closet space, master br has a walk-in closet & full bath. Attic space for storage, 2 car garage w/separate attic space for more storage & new garage door openers. New 2-zone heating/cooling system, new water system & water heater. Outside deck & fenced-in patio to enjoy looking at the 5 acres & beautiful blue mountain. Close to everything the Poconos have to offer!